Uuuuh! I so so much loved this movie. It has some little flaws, sure, but I feel so thrilled every time I walk out of the cinema (four times – so far). I would never have imagined that watching a real powerful female hero to have such a strong impact on me. We all have seen so many male heroes on screen who are pretty cool most times and I didn’t think it would be such a big deal to switch to a female heroine, but it felt completely different to watch a woman do the same as her male counterparts. 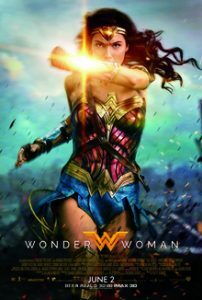 Sadly my male friends don’t understand why Wonder Woman gets me all excited – again and again. I cried, I laughed, I sweated in pure excitement. They just can’t feel the difference as I do. Anthiope was awesome! This is the kind of heroine we need to see more of. Men get the experienced, maybe world-weary warrior or grizzled veteran types all the time. I was thrilled to see a woman take this path, too.